To justify this change, the System E advocates were also obliged to apply a new interpretation to the “Last Supper,” explaining why the messiah and his disciples observed the 14th of Abib as the Passover supper if the 15th was deemed the proper time under the Torah of Moses. In the region of Syria, meanwhile, theologians, who had supported System A and System D and were influenced by the Council of Nicaea to adopt System E, developed a hybrid solution in order to overcome the strong Quartodeciman leanings of that region. 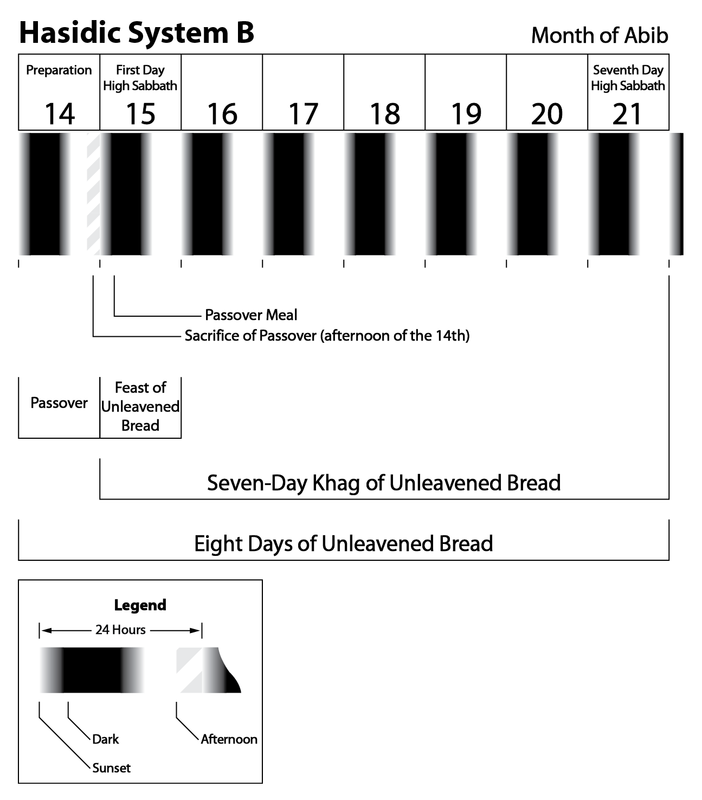 They adopted System F. The Syrian hybrid System F kept the 14th as the Passover (the “Last Supper”) but then utilized the Hasidic System B for the seven days of Unleavened Bread (i.e., from the 15th until the end of the 21st). In this fashion, they were able to observe, along with the West, the Friday and Saturday fast and to celebrate the first day of the week within the seven days of Unleavened Bread as the Passover of the resurrection. In effect, System F actually served as a transitional phase. As time progressed, the East, for the most part, dropped System F and fully adopted System E.
Finally, we shall address System G, a late and contemporary invention that is also built upon the Hasidic construct for the seven days of Unleavened Bread. 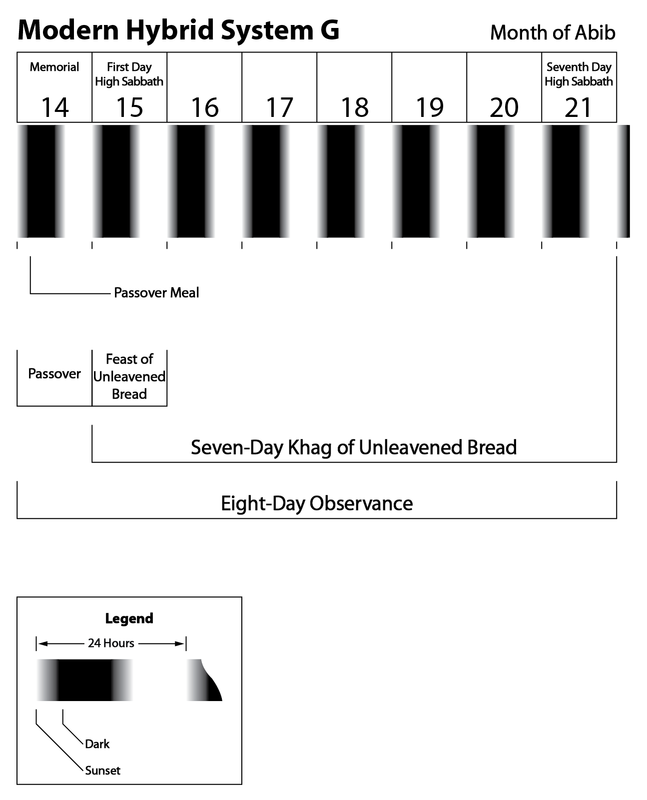 Like her sister systems, System G observes the seven days of Unleavened Bread from the 15th until the end of the 21st of Abib and, like System F, keeps Passover on the 14th of Abib. To counter the Quartodecimans, the western assemblies, under the leadership of Irenaeus, bishop of Gaul, and Victor, bishop of Rome, abandoned System D, which observed the 14th through 20th days of the first moon for the seven days of Unleavened Bread. They adopted in its place System E, which utilized the Hasidic construct for these seven days (i.e., counting from the 15th until the end of the 21st day). 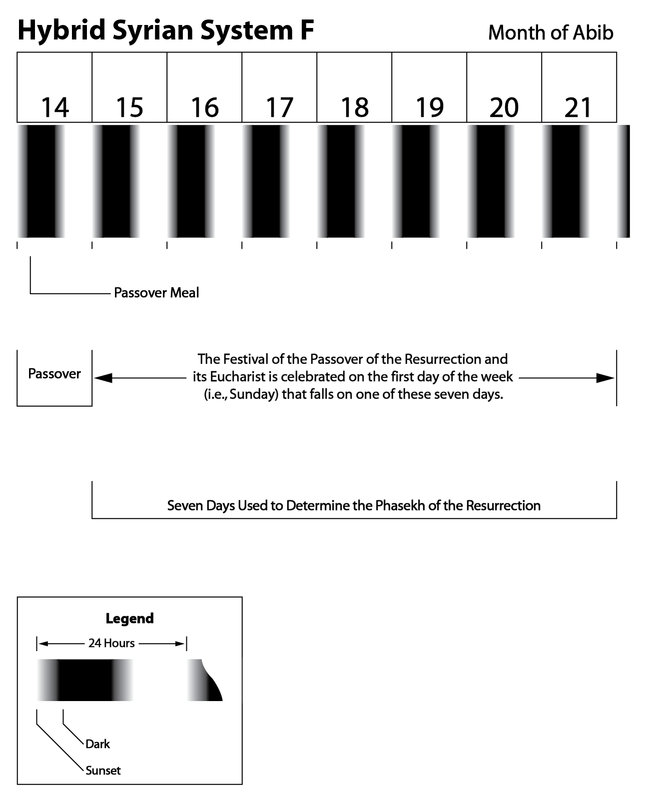 The advocates of System E advanced their formula by making the claim that the Pharisees had been correct all along in observing the 15th as the legal Passover and as the first day of the seven days of Unleavened Bread. Armed with this Pharisaic view, the advocates of System E denounced any celebration of the 14th as a day of Passover. Instead, they advanced the doctrine that, at the messiah’s “Last Supper,” he never actually kept the legal Passover of the written Torah. Rather, they claimed that he merely kept the 14th as a typology for a new Christian Passover which took the place of the old Jewish Passover. Though Good Friday (which they calculated as the day of the week when the messiah suffered death) and the following Saturday were also observed in remembrance, these days were treated as a time of fasting. The celebration of the new Christian Passover as a feast, on the other hand, was kept only on the first day of the week, the day of the resurrection, called “the Sovereign’s day” (the “Lord’s day” in popular English culture), when that day fell during the seven days of Unleavened Bread (i.e., from the 15th through the 21st days of the first moon). The “Last Supper” – Not the Legal Passover? The System E view is clearly set forth by three important and early supporters of that interpretation: Hippolytus, Peter of Alexandria, and Chrysostom. The first detail noticed, as already demonstrated earlier, is that the western assemblies had lost touch with the difference between the dogmasin (public decrees) of the Mosaic Torah and the earlier statutes followed by Abraham. The fact that the Mosaic dogmasin, such as fleshly circumcision, had been set aside has nothing to do with whether or not the festival and sacred days of Yahweh are to be kept. To this doctrine, the proponents of System E added the legal interpretation of the Passover advocated by the Hasidic Jews. For example, Peter agrees that the 14th was the day upon which the Passover was sacrificed and the messiah died.15 Nevertheless, Peter only accepts the Pharisaic view that, under the written Torah, the high Sabbath was the 15th, the first day of the seven days of Unleavened Bread, and the correct time of the Passover supper. The point of this argument is that the messiah ate his “Last Supper” on the 14th, the day of his execution. Yet, after the Jewish leaders had delivered Yahushua to Pilate, they were still waiting to celebrate their Passover meal (i.e., with the arrival of the 15th). The difference between the two positions was the insistence by the advocates of System E that the Jewish leaders (who utilized the Hasidic calculations for the week of Passover) were correctly observing the legal Passover of the written Torah. The Quartodecimans claimed the Jewish leaders of that time were mistaken. In this way, Chrysostom counts eight days of Unleavened Bread yet makes the first day of Unleavened Bread come before the seven-day Festival of Unleavened Bread. According to this view, the new sacrament was not appointed previously to the day of the messiah’s “Last Supper,” but was given at that time because the written Torah was to cease. Chrysostom adds, “And thus the very chief of the festivals (Passover) he (Yahushua) brings to an end, removing them to another most awful table.”28 Thus began a new table from which we are to eat a new Passover with new rituals and meanings. Because the messiah’s “Last Supper” was observed on the 14th, it was also reasoned that it could not be the legal Passover of the Torah of Moses, which was observed by the Jewish state on the 15th. The interpretation was then advanced that, since the messiah’s Passover was held on the 14th, it was a typology for Christians, meant to be expressed in the future only on the joyful celebration of the day of the resurrection (the Sovereign’s day), which fell on the first day of the week during the seven days of Unleavened Bread. It was therefore advanced that the “Last Supper” actually allowed Christians to keep the Passover annually on the first day of the week during any one of the seven days of Unleavened Bread (i.e., from the 15th through the 21st day of the first moon). They also agreed that the unleavened bread and wine consumed at the Passover meal revealed a higher meaning as symbols of the messiah. Yet, they ardently disagreed with the System E premise that the Passover supper kept by the messiah just prior to his death, falling as it did on the 14th of Abib, was not the legal Passover. Neither would they admit to the idea that the messiah observed the Passover only this once on the 14th, and that this one-time celebration set an example which gave Christians permission to change the official reckoning for the date of the Passover supper and mystery of the cup and bread. Abbot Ceolfrid goes on to deny that the 14th was one of the seven days of Unleavened Bread by identifying the night that Israel was brought out of Egypt with the 15th, being the day after the Passover (sacrifice), according to the Hasidic interpretation of Numbers, 33:3. Time to conclude Part I. In our next post we will provide evidence for the full approval and appointment of System E by Emperor Constantine leading up to the present, but flawed, practice of System G held to by the many Sacred Name groups of today. So be sure to continue reading with 28. Passover – Evolution to Today II. 1 B. Sanh., 43a, “And it is tradition: בערב הפסח (On the arab of the Passover) they hung Yeshua (Yahushua the Nazarene). And the crier went forth before him 40 days, (saying), ‘(Yeshua) goes forth to be stoned, because he has practiced magic and deceived and led astray Israel.’” The terms “Arab” and “the Passover” are used here in the Pharisaical sense, i.e., to refer to the “afternoon” of the day of the Passover sacrifice (Abib 14). 3 Matt., 26:17; Mark, 14:12; Luke, 22:7. 4 Mark, 14:12-17; Matt., 26:17-20; Luke, 22:7-14. 5 JTS, 9, pp. 305-307; EWJ, p. 16–19, p. 16, n. 2, p. 19, n. 2; CSJBO, pp. 119f. 6 Mark, 14:12; Luke, 22:7. 8 Hippolytus, Ref. Her., 6:11. 9 Hippolytus, Ref. Her., 6:11. Hippolytus misses the intent of Saul’s comment. Saul also commands men to keep the Passover festival (1 Cor., 5:7-8). Circumcision was a dogmasin (public decree) and was never a pre-Torah olam (age-lasting) statute. As shown in FSDY, chaps. 4-8, the Festival of Passover and Unleavened Bread differs from circumcision in that it is an olam statute attached to the Covenants of Promise and does not find its origin as a dogmasin of the Torah of Moses. 12 Peter Alex., frag. 5:1. 13 Peter Alex., frag. 5:1-7. 14 Cf., Jos., Antiq., 2:15:1. 15 Peter Alex., frag. 5:1, 2, 7. 16 Peter Alex., frag. 5:7. 19 Peter Alex., frag. 5:4. 20 Peter Alex., frag. 5:7. 22 JE, 4, p. 75. 29 For example, this theme is expressed throughout the work on the Passover by Melito of Sardis. Also see Ps.-Hippolytus, 1–3; Pas. Proclam., Exsult., 4. 30 E.g., Eusebius, H.E., 7:32:14–17; Ps.-Chrysostom, 7:4, 35; Bede, Hist., 5:21. 36 The term ad vesperam (at twilight) is here a translation of the Hebrew term בערב (be-arab), but is interpreted in the Pharisaic fashion as late afternoon. This entry was posted on 02/13/2013, 4:46 pm and is filed under Calendar, Easter, Feast Days, Passover, Quartodecimans, Religion, Scriptural Calendar, Unleavened Bread, Yahweh. You can follow any responses to this entry through RSS 2.0. You can leave a response, or trackback from your own site.